Brookwood Cemetery, the largest in the UK, is the resting place of secularist politician Charles Bradlaugh. Bradlaugh died in 1891 as the House of Commons expunged the resolutions forbidding him to take his seat. He was buried at Brookwood in the presence of thousands of his admirers. He is buried in a family grave in plot 108. The memorial used to include a fine bronze bust by the sculptor Francis Verheyden, but this was stolen some years ago. The pedestal also included a bronze wreath but this has also been stolen from the memorial. Brookwood Cemetery or London Necropolis, like Highgate Cemetery was created in the Victorian period. At one point, it was the largest cemetery in the world. 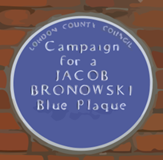 Due to several high profile incidents involving the internment of its citizens, there was a push for the creation of more cemetaries outside of the city centre in Victorian England. 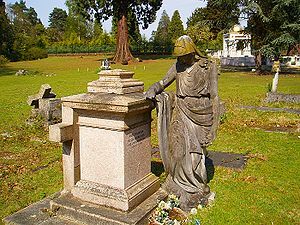 Many of the cemeteries that are landmarks today were created in this period, such as Brookwood, Highgate and Kensal Green. Brookwood Cemetery was created by the London Necropolis Company in 1849. Brookwook had its own rail line and was spread out over 2,000 acres near Woking, Surrey. The building of the cemetery and the workings of the London Necropolis Company were fraught with infights and take over battles. The Necropolis Church was built to cater to all denominations. Additionally there is a large military cemetery which includes soliders from the Commonwealth as well as the United States. Regular trains depart from Waterloo Station to Brookwood, near the cemetery.